It all started some years ago when I converted a Drag Star into cash, then after a long drive to Templemore and a short conversation with the unreasonably grumpy owner, I turned cash back into bike. It was the bike I’d been after for some time as what I wanted to do more than anything was load it up and head to warmer climes. After what seemed like an eternity, that eventually came around when myself and herself hopped on the bike and took it to warmest of warm France via drizzly England. 2500 or so miles later and we were back where we started; Rosslare. So after that, it sat covered in the garage waiting for it’s next excursion. At that stage I’d found a job that offered a company vehicle. Bad news for the bike really. I didn’t fully realise it back then but it wasn’t long before the tax expired, the insurance expired and getting it back on the road seemed less and less likely. So it sat in the garage under a canvas cover. I still had notions of getting back out on it for the summer but that dream went flat at the same time as the bikes battery. Wheeled out every so often for a wash and polish and once or twice when someone came to look at it. I mistakenly thought it’d be an easy bike to sell because it was rare. In fact, it’s probably the only one in Ireland. (That is, the only limited edition model). In reality though, all this made it harder to sell. I went through some unpleasant telephone conversations with dealers. Self styled motorbike guru’s who each assured me they knew the market backwards. Some offered to ‘do me a favour’ by taking the bike off my hands for significantly less than I asked for. No thanks. It was listed on various advertising websites for ages and I’d get the odd phone call or email regarding it. 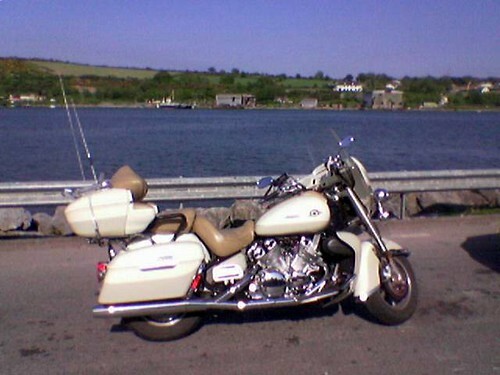 Then, a very decisive bike owner from Wexford visited me yesterday and converted bike back into cash. I’ll miss it and I very much doubt I’ll be bikeless for very long but for now at least, it’s as if I’m missing part of the family. The only consolation is that with the cash raised from it’s sale, I can now be debt free for the first time in about 7 years. Well, apart from the mortgage… that doesn’t really count though as we’ll be paying that off for the next thirty years! This entry was posted by Ryan on March 16, 2008 at 1:07 pm, and is filed under Diary of a Madman, Life in General. Follow any responses to this post through RSS 2.0. You can leave a response or trackback from your own site. Debt free apart from the mortgage – sigh. Perhaps I should sell a part of the family… would anyone like to buy two elderly Jack Russells? I sighed as well 🙁 I think I was debt free when I was 12, maybe 13. A camera phone cannot do justice to the lovely lee as its winds it way from Monkstown to Passage West.